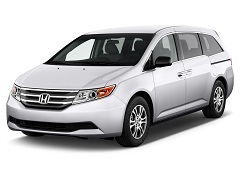 If you are in the market for a minivan, you may compare the Toyota Sienna minivan to the Honda Odyssey Touring Elite. While the Honda model does have some of the best equipment, is it worth the price? Pros: The Honda Odyssey Touring Elite comes with all the benefits of the Touring model with some cool benefits. For one, the safety components are excellent as it comes equipped with parking sensors and a Multi-Angle Rearview Camera thereby making it easier for drivers to navigate in and out of tight spaces. Along with this, it comes with other Honda Odyssey accessories like a Honda Satellite-Linked Navigation System, a DVD rear entertainment system and a hard disk drive. These are perfect features for the technologically savvy that want the best in entertainment options for their passengers. The Honda Odyssey parts that separate this model from the others is safety components like the high intensity discharge headlights and the blind spot information system. Along with this, the Elite version of the Honda Odyssey Touring comes equipped with a DVD Ultrawide Entertainment System with theatre surround sound. As these features make the Honda Odyssey Touring Elite compare with their luxury SUV counterparts, does the price make all the equipment worth it? Cons: The only drawback to this model for most families is the price, as it starts out at over $43,000. While it does offer state of the art equipment that can protect your family and entertain them, many of the other Odyssey models come with excellent safety and entertainment features for less money. Ultimately, the Elite is an excellent model that offers the best in safety benefits and entertainment technology. With that said, many other Odyssey models offer the same great safety and entertainment features therefore unless you need to have the most expensive model, this is an unnecessary buy.